Welcome to By My Hand and Pen, dedicated to the love of folk art, the continued passion for historic documentation, and the expression of how our past and present live side by side. 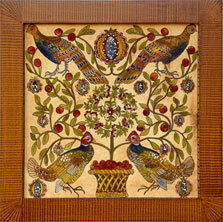 Judy has been creating folk art for more than twenty years. Much of her work involves, Fraktur, Pennsylvania German for "broken". It described the broken calligraphy of early schrivers (writers) rather than the pictures they created. Heavy archival paper forms the base of paintings. Large sheets are given repeated "washes" to replicate 19th centruy laid paper. From there her original compostions take shape, often intricate and with great detail. Because she lives along the New England coast, many of her customers request paintings that remind them of the sea; mermaids, ships, whales, paddleboys, and native birds. 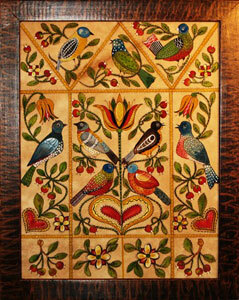 However, customers in other parts of the country and internationally, love her soldiers and her many bird paintings. She honors many commission requests for one-of-a-kind marriage and anniversary certificate celebrations, birth announcements, home , family blessings or treasured family prayers. A book illustrated for one client, contained more than thirty illustrations of beloved poems, was professionally bound and presented for a 50th wedding anniversary. Long a writer, her whimsical artwork is often accompanied by original humorous poems and songs with "updated" lyrics. 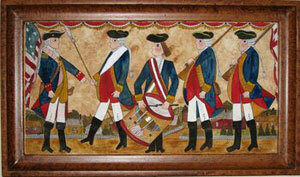 Frames are vinegar painted or grained on hardwood frames and then finished with layers of varnish and wax. Occasionally a unique antique frame is used for specific works. Paintings are routinely done under glass, and are signed on the painting and back dust cover. Each heirloom is signed by the artist, and arrives ready to hang. For the past eleven years Judy has been honored by Early American Life's Master Craftsmen Award, given to only 200 artists nationally who demonstrate a mastery of their craft as well as an adherence to using the original tools and methods in their creation. All artwork, photographs, original poems, and other written language are the exclusive property of Judith H. Brinckerhoff and are protected under U.S. copyright laws. Any reproduction is strictly prohibited. All rights reserved.